Tasty, easy Vegan Broccoli Salad with Green Tahini Sauce! Can I just admit something? I love broccoli. It is, to me, one of the most underrated vegetables of all time. Especially because it’s the quintessential veggie that all kids apparently hate. “Eat your broccoli!” was something we’d all inevitably heard our mothers say growing up. Well, mom, look at me now! 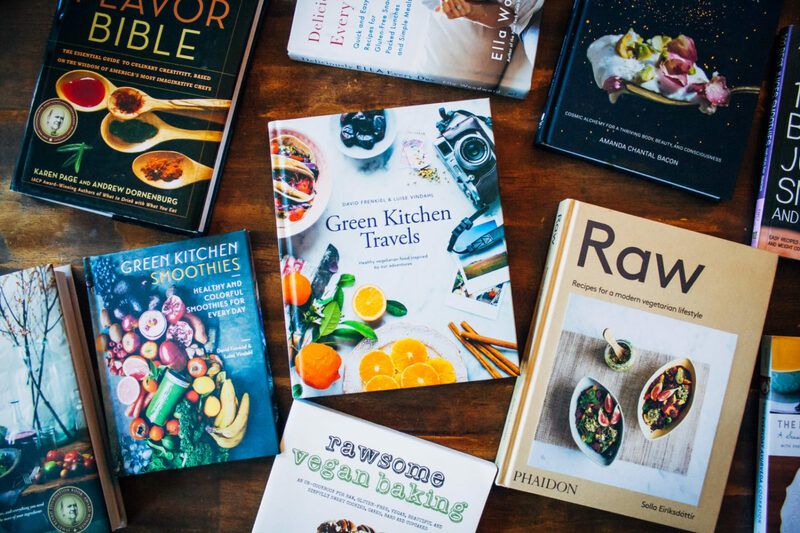 You know, it’s really funny that I became a plant-based blogger, because I didn’t eat a ton of vegetables (especially green ones) when I was young. My family is a very “meat and potatoes” type of unit, and we mostly ate… you guessed it… potatoes. In fact, it was because of this that I found my love for cooking. The reason I ate meat when I was younger is because I didn’t understand where it came from. When I was eight, I learned what happened to cows and actually got sick to my stomach in the face of that knowledge. I immediately stopped eating it, and haven’t had any for over 17 years. When I learned more about where my food had came from, I told my mom I didn’t want to eat her meals anymore. She said, “That’s fine, but if you want to eat something different, you’ll have to cook it yourself.” So I did! I started experimenting with cooking between the ages of 12-14 years old. One of my favorite meals was vegetable broth seasoned with Old Bay spice (I have no idea how that started) and served with noodles. I still eat that now! I also subsisted off of carrots and pretzels for many many years. Then, when I decided to go vegan, I really started pushing the envelope with vegetables and other plant-based foods. In fact, that’s how my blog was started. I called it “Adventures in a Plant-Based Kitchen” because that’s exactly what it was – and continues to be. At this point in my life, I eat 90% vegan and 10% vegetarian. This is what works best for me and my health, but I recognize that other people may have different eating regimens for their well-being. 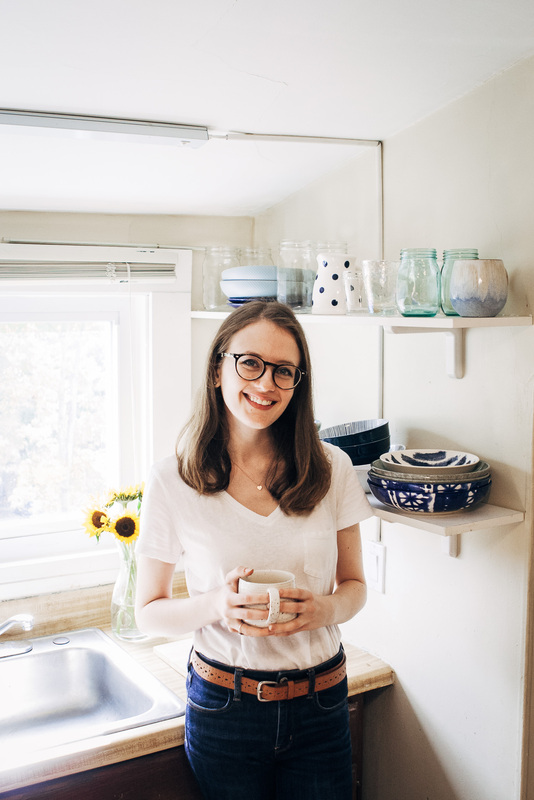 The goal of my blog has been, and always will be, to showcase delicious plant-based eating that is accessible to anyone, whether they are vegetarian, vegan, or omnivorous. In that spirit, I hope you will like this recipe I am providing today. Broccoli, when simply roasted with salt and pepper, is absolutely delicious. 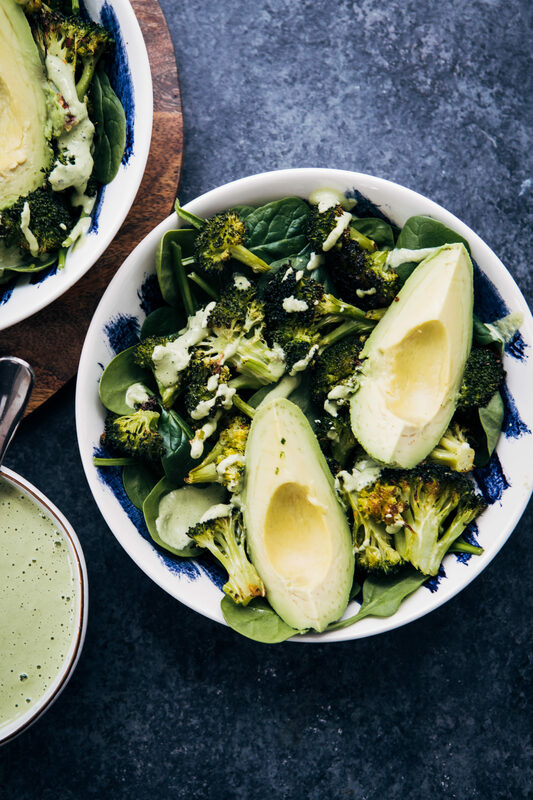 But what really makes this vegan broccoli salad is the flavorful herby tahini sauce. This recipe will make a little extra, so you’ll have a ready-made salad dressing for the rest of the week. It’d also be delicious with fries or spread on sandwiches! Cheers! 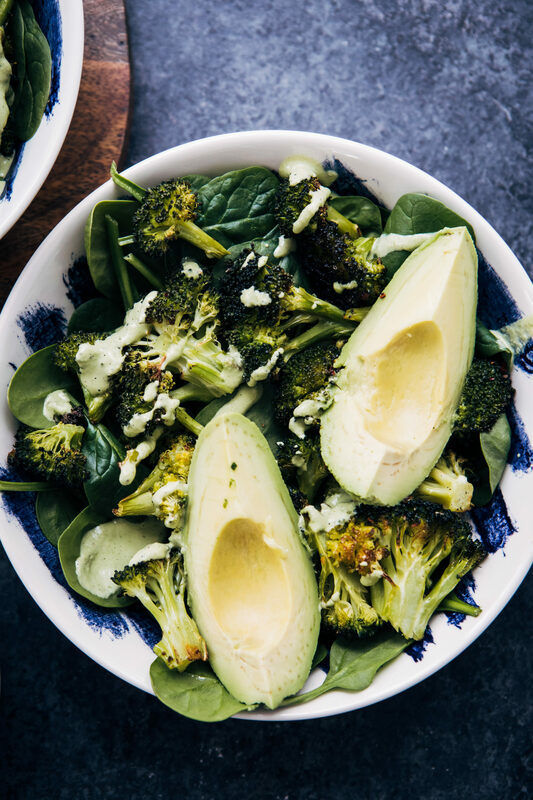 This vegan broccoli salad is super fast and simple to throw together, with roasted broccoli, greens, and a mouthwatering green herb tahini sauce! Wash and dry your broccoli. Cut it up into bite-sized florets (see photos for reference). In a bowl, mix broccoli florets, a drizzle of olive oil, salt, and pepper. Mix well until broccoli is evenly coated. 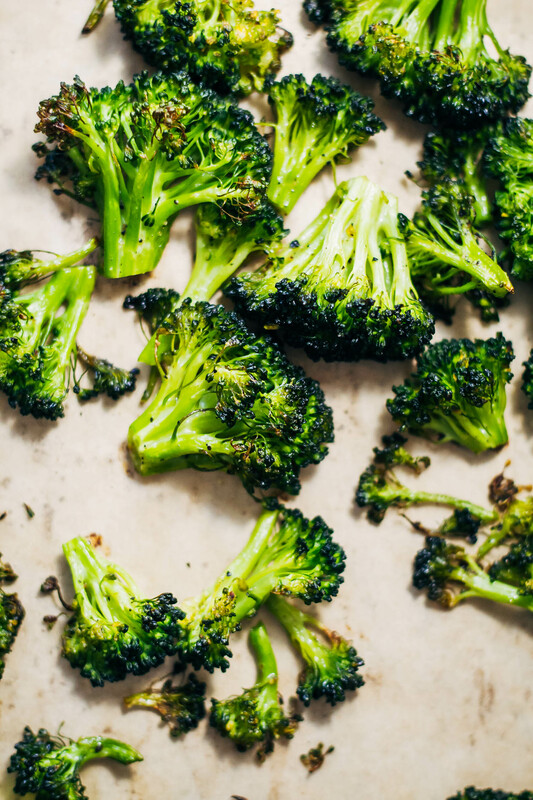 On a baking sheet lined with parchment paper, bake broccoli in the oven for 20-25 minutes. In a blender, combine all sauce ingredients, and blend on high until everything is smooth and creamy. Taste, and adjust seasonings if necessary. Just a note - if you want your sauce to be spicier, add in a few of the jalapeño seeds! Add in some mixed greens to 2 or 3 large bowls. Add on a layer of the roasted broccoli, and drizzle everything with the tahini sauce. Top with sliced avocado and some sesame or hemp seeds, if you like. Fresh cracked black pepper is delicious on top! The herby tahini sauce will keep in the refrigerator for 4-5 days. OK, this is GORGEOUS! Two of my favorite flavors together in one bowl! I absolutely love roasted broccoli, but I’ve never had it with an herby tahini. I’m so glad you thought of it because it’s delicious!! I love roasted broccoli. It is one of my favorites. This is so beautiful! Roasted broccoli is one of my favorites too! Especially when roasted simply with salt and pepper, it hits the spot! Sarah, thanks for posting! I didn’t realise it would taste so good I would eat the whole head in one sitting! I just added yeast flakes.